Valve has shared a new Steam Distribution agreement that for the first time includes revenue share tiers. Until now the standard revenue split on the platform was 70 per cent to the developer and 30 per cent to Valve. This will change on a sliding scale, depending upon game revenue generation, with the best tier becoming 80/20 in the developer's favour. However, to start to benefit from movements in the split, any particular game must have earned greater than $10 million. The above new tiers will only tally revenue earned after 1st Oct 2018. The revenue figure isn't just for the base game but includes DLC, in-game sales, and Community Marketplace game fees. Valve's stated idea is to reward the makers of the most successful games and further reward them for the "positive network effects," such as the earnings from DLC etc. One other nicety for the larger developers is a change to the agreement regarding confidentiality of sales data. 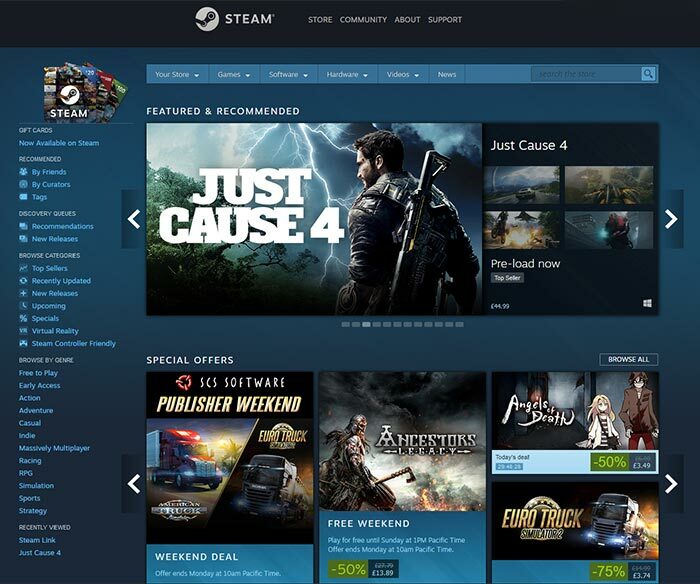 From now on Steam partners will be able to share sales data about their game as they see fit. Other agreement tweaks include some to pay heed to GDPR and safety warranties prompted by VR experiences. What isn't mentioned by Valve / Steam is that the headlining adjustment to revenue splits made for the biggest developers / publishers might help make Steam sticky - prevent AAA games ignoring or migrating away from the platform to other/own brand digital stores. We don't want people setting up their own shop anyway, right? On one hand I don't want to have loads of different launchers installed on my desktop, but competition is a good thing. I'm guessing this move is a result of that. I do wonder if this will incentivise more microtransations implemented in games which will be a pain in the arse. On one hand I don't want to have loads of different launchers installed on my desktop, but competition is a good thing. This is something of a myth. Competition between game developers is good, competition via an increasing number of platforms is nothing but frustrating for the end-user. What sort of competition are you even talking about? As long as the platform functions (can download and launch games) how can any competition be had? Especially considering the only reason people use additional platforms is because one game or another is exclusive to that platform… that isn't competitive, it is anti-competitive. “Competition is good” in general is something of a controversy too, but I'll leave the politics for another post. Hmmm… maybe it's me but I'd rather see it the other way round, all this is doing is giving more money to companies that can likely already charge higher prices and can afford the dev costs in the first place, rather than giving the small indie companies, who charge a lot less in most cases, a bigger share so they can maybe develop more games or expand their current game etc.